AstroDome Planetarium Birthday Parties are not available in December, January, and February. Only one birthday party booking will be accepted in other months, with the exception of July and August, which will have a maximum of two per month. Are you looking for a unique birthday party for your child? 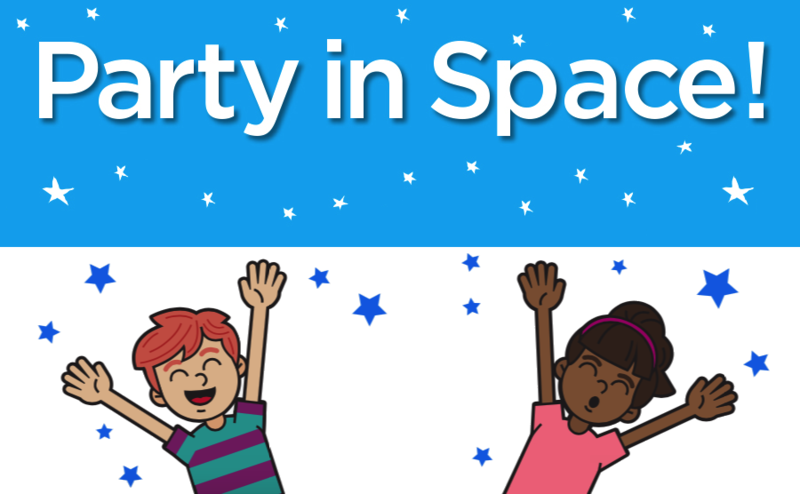 If so, why not have a "party in space" inside an inflatable planetarium! The AstroDome Planetarium is Alberta's most popular portable planetarium and it can accommodate your birthday party audience of up to 30 kids and 15 adults. That's 45 people inside the planetarium all at once! The hour-long program includes a full-dome movie, a tour of the night sky, and an opportunity to hold an actual iron meteorite in your hands. 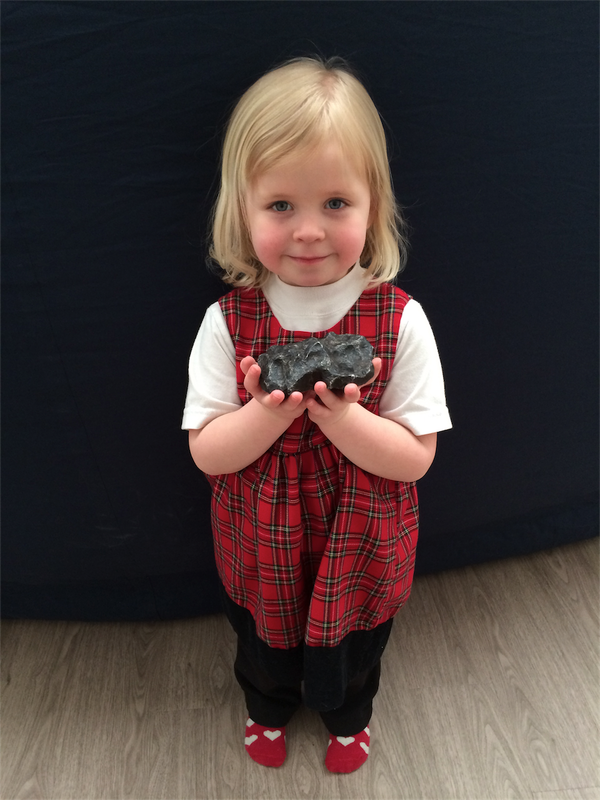 The meteorite is an impressive museum quality specimen that will surely impress everyone at your party! 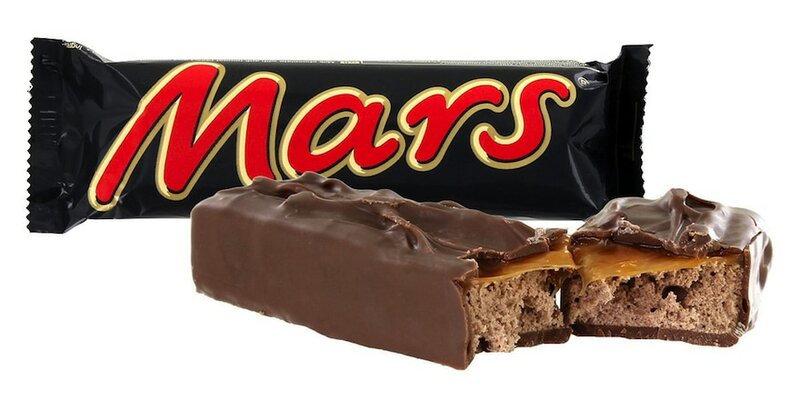 Also included with the Birthday Party is a full-size Mars bar for each child, which you can add to your loot bags. There are three parties to choose from, based on the age of the birthday boy or girl. The maximum number of children is 30. There is no minimum number of children required, however, there is a minimum charge, which is equal to the cost of a birthday party with 8 children in attendance. Also, there is no charge for adults, but the number of adults can not exceed the number of children. The maximum occupancy of the planetarium, both children and adults, is 45, not including the presenter. The Little Dipper Party includes the full-dome movie One World, One Sky: Big Bird’s Adventure as well as an age appropriate tour of the night sky and a short simulated flight into space and through the Solar System. It also includes a full-size Mars chocolate bar for each child and an opportunity to hold a museum quality iron meteorite in your hands. This party requires at least one chaperone for every four children. If you would rather watch a different full-dome movie, please take a look at the "New Movies" section of this web page, located below. The Big Dipper Party includes the full-dome movie Back to the Moon for Good as well as an age appropriate tour of the night sky and a short simulated flight into space and through the Solar System. It also includes a full-size Mars chocolate bar for each child and an opportunity to hold a museum quality iron meteorite in your hands. This party requires at least one chaperone for every five children. The Milky Way Party includes the full-dome movie Two Small Pieces of Glass: The Amazing Telescope as well as an age appropriate tour of the night sky and a short simulated flight into space and through the Solar System. It also includes a full-size Mars chocolate bar for each child and an opportunity to hold a museum quality iron meteorite in your hands. This party requires at least one chaperone for every eight children. Please note that a fast WiFi connection is required in order to stream these on demand movies. Also, there is an additional fee ($30 to $50) associated with these streaming on demand movies. The AstroDome is based in High River and if the planetarium is taken to a location that is greater than 75 km from this location there will be a Mileage Surcharge added. The actual cost will be determined based on the address of the venue where the birthday party is held. 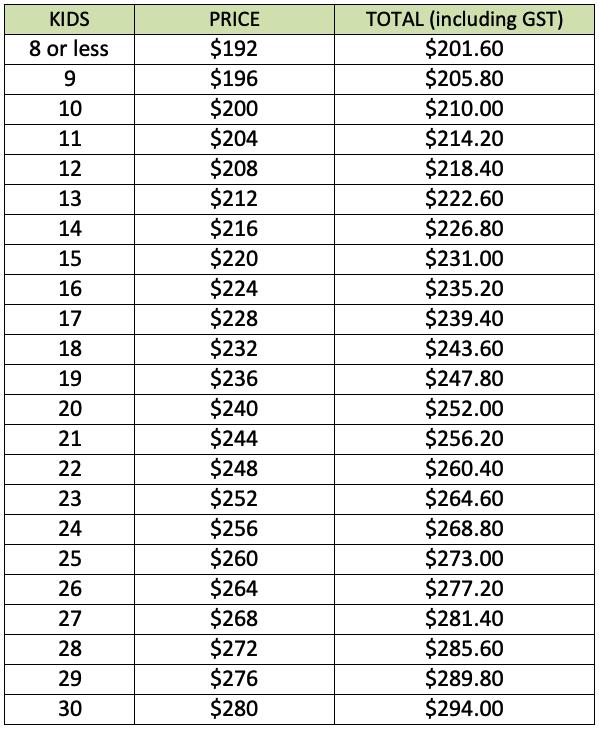 The approximate surcharge for various locations in Southern Alberta appears below. Please note that the northern most parts of Calgary, such as Tuscany, Royal Oak, and Coventry Hills, will have a small mileage surcharge added. If the birthday party is held in High River or a nearby community (within 35 km of High River) a small discount will be provided. The planetarium is a special type of theatre. It's inflatable, but it's NOT a bouncy castle / bounce house. The planetarium is ALWAYS set-up indoors. It's NOT intended for outdoor use. The planetarium is quite large and requires a room with a minimum unobstructed ceiling height of 12 feet. The planetarium will probably NOT fit inside your house. You will almost certainly have to rent a space to accommodate the planetarium. It takes approximately 40 minutes to set-up the planetarium and a similar amount of time to pack it up. Food, drinks, candy, snacks, and gum are NOT permitted inside the planetarium. The audience members will be asked to take off their shoes / boots before entering the planetarium. The audience usually sits on the floor inside the planetarium. However, if need be, chairs can be set-up inside the planetarium. You will need to provide these chairs. Fold-up chairs work best. Audience members should be encouraged to go to the bathroom BEFORE they enter the planetarium. The planetarium is not recommended for those under three years of age. The planetarium requires electricity and so an electrical outlet must be situated nearby. 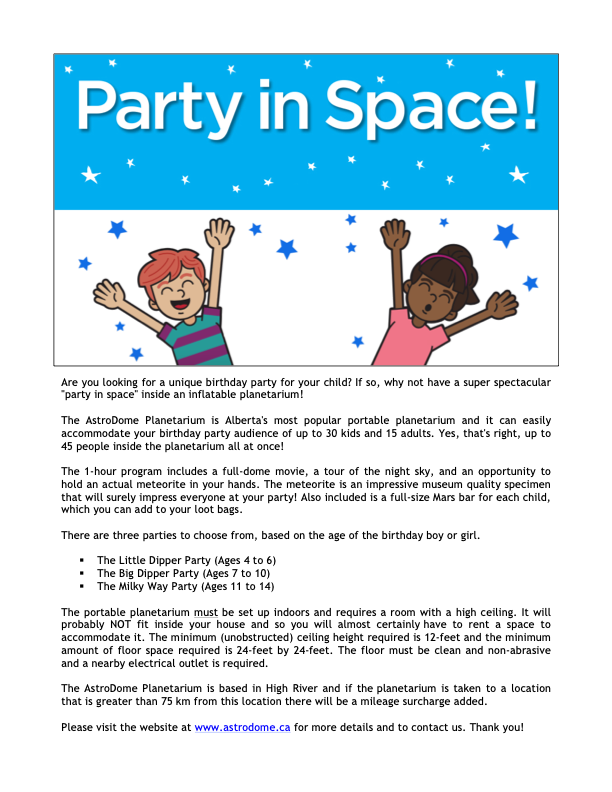 Please contact us if you have any questions or concerns regarding an AstroDome Planetarium Birthday Party. Click on the image below to download the 2-page brochure.